Learning something from the pagans – For the fainthearted . . . The first day of May, a bank holiday Monday, a trip to the Somerset town of Glastonbury brought an encounter with a large crowd gathered to mark the pagan festival of Beltane. Faces painted green, head dresses woven from ivy, outlandish clothes, many of those gathered might have stepped out a scene from JRR Tolkien’s Lord of the Rings. There was an air of celebration, laughter, joy. People were smiling and animated in their participation in the activities. Proclamations by a man in the costume of a town crier were greeted with loud acclamation. 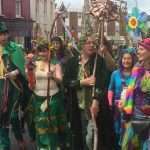 Sounds of drumming and chants were followed by a procession down the high street by musicians and a group carrying a large wooden pole. Reaching the bottom of the street, the procession moved into the middle of the crowd, where there was a loud declamation, before the whole assembly moved off, making slow progress back up the street, with the pole in the middle, followed by those carrying a long dragon made from fabric and held aloft on sticks. The pole was a tree trunk into which various symbols had been carved; when the procession reached its destination, it would be erected as a maypole. The gathering radiated energy and enthusiasm, people of all ages had come to participate in the Beltane ceremonies, but also to enjoy themselves as they did so. Posting on Faceook, a couple of dozen photographs of those gathered for the celebration, a friend from an evangelical church in England immediately posted a comment saying “heathen.” A retort was posted that said that at least they didn’t bomb people in the name of Jesus. Further discussion ensued, including the suggestion that most of those present were probably anarchists or libertarians and were probably not so far removed in their attitudes from the apostles in the second chapter of the Acts of the Apostles, who regarded even personal property as something that could be sold to help the poor. If one had talked to the “hippies” who comprised the majority of the crowd, their values would have included a respect for the Earth;, a commitment to living environmentally responsible lives; a favouring of vegetarianism or veganism so that animals did not suffer cruelty, and so that there would be a more efficient use of agricultural land; a commitment to peace and an end to the spending of trillions on weapons of destruction; a natural acceptance of the equality of women; an attitude of inclusion towards strangers and towards minorities; a tolerance of those whose views differed from their own. Strangely, if one compared the attitudes of the pagans with the attitudes of the “evangelicals” who support Donald Trump, it would not be hard to determine which group were closer to the teachings of Jesus of Nazareth. I was in the UK when Thatcher turned the full force of the media and the State upon the New Age Travelers, a more harmless bunch you’d travel far to find. She darn near exposed them to the hate and vitriol reserved for enemies at a time of war. But of course she was questing for targets at the time. The way these guys play out their lives is closer to a peaceful Buddhism than any authentically Celtic. The one thing I find interesting is the May Tree supposedly brought by an Joseph of Arimathea to the Tor at Glastonbury. I’m fairly certain it was introduced to control the great flocks. But my only difficulty is I’m uncertain if it was the Ordo Sancti Benedicti, or the great ranges of the Roman Empire that brought the thorn. Offering a thought for Madelaine McCann, it’s ten years since. I had forgotten the demonization of the New Age Travellers. I think their offence was to challenge the very basis upon which a capitalist, materialist society rested; they challenged the worship of Mammon that was at the heart of Thatcherism. 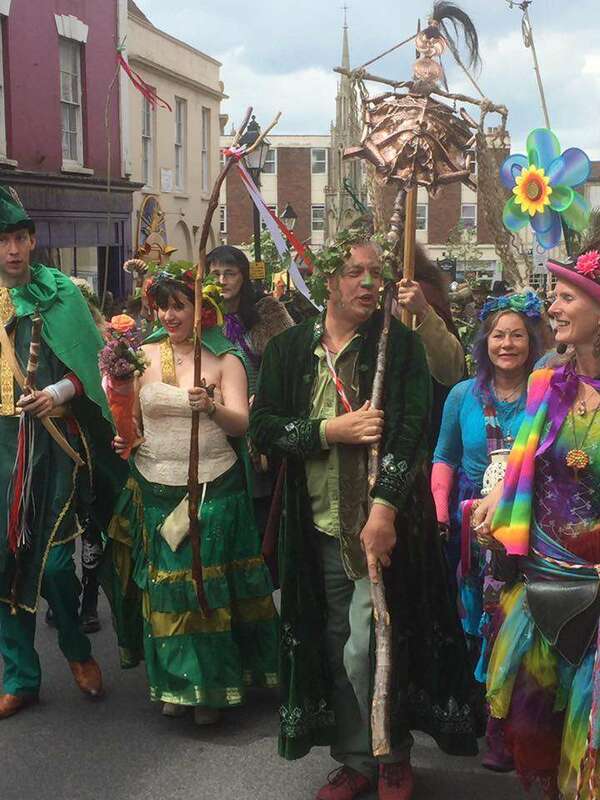 You’re right, the Eastern mystical tradition is very evident in the Glastonbury tradition, its gentleness is the antithesis of the violence of the Celtic penitentials. Despite the centuries old Christian traditions, the churches in Glastonbury seemed to have no spirituality with the attractiveness of that on offer in the High Street.